Potato plants can be grown by burying actual potatoes, technically known as "seed potatoes." Larger seed potatoes are sliced into sections, each containing one or two eyes, before planting. Though potato plants are relatively low-maintenance and hardy, fungi on the seed potatoes themselves can cause a variety of potato diseases, including potato scab and black rot. Soaking the potatoes in a variety of solutions kills the problem-causing fungi and helps ensure a healthy potato plant and a bountiful future harvest. Fill a gallon-sized plastic bucket or container with nine cups of fresh water. Add one cup of standard household bleach. Mix the bleach and water thoroughly with a spoon or other stirring tool. Drop the potatoes inside the solution. Let them soak for five minutes before removing them from the solution. This kills most bacterial and fungal diseases, according to OISAT, a European agricultural resource service for farmers and extension workers. Fill a gallon-sized plastic bucket with 1/3 gallon of fresh water. Add 3/5 teaspoon of mancozeb, a commercial fungicide recommended by the University of Hawaii. If you're using another agricultural fungicide, such as benomyl, consult the specific chemical's label for mixing instructions. Put the potatoes into the solution. Let them soak for 15 minutes before removing and planting them. Pour a gallon of water into a plastic bucket. Mix in 2/3 cup of borax. Place the potatoes into the borax solution. Soak the potatoes for 10 minutes, then remove and plant them. 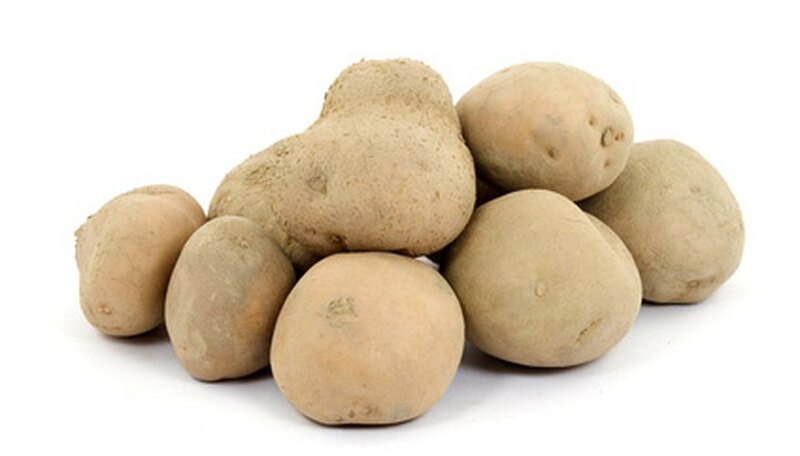 Borax effectively kills the various fungi that cause potato problems, like black rot, according to Clemson University's cooperative extension service. Plant the potatoes immediately after you've soaked them.